Anthony Privette is a highly regarded North Carolina workers’ compensation attorney dedicated to providing the highest quality legal representation to workers injured on the job in Statesville and other areas of North Carolina. He has successfully handled work-related claims before the Industrial Commission, North Carolina Court of Appeals, as well as the Supreme Court of North Carolina. Mr. Privette can help you identify all sources of liability and maximize recovery for your claim. The North Carolina Industrial Commission administers the Workers’ Compensation Act. This establishes an accident insurance program, paid for by employers, that provides medical, rehabilitation, and income benefits to workers injured on the job. According to this law, employers must pay compensation for personal injury or death where the accident “arises out of” or occurs “in the course of” employment. Further, the right to compensation and other benefits for disability, disfigurement, or death is not affected by the liability of third parties; employers and their insurance carriers may proceed against the third party to enforce liability. Finally, North Carolina workers’ compensation laws require prompt payment of compensation to the injured party. These payments must continue until the terms of the award are fully satisfied. Workers’ compensation claimants are entitled to several forms of damages under state law. First, they are entitled to medical expenses, including hospital bills, emergency care, and continuing treatment of the injury. Second, they can recover lost income and other disability benefits, amounting to a sizeable portion of their average weekly wage. Most benefits depend upon the nature and extent of the injury and whether they result in a partial or total loss of function in different parts of the body. 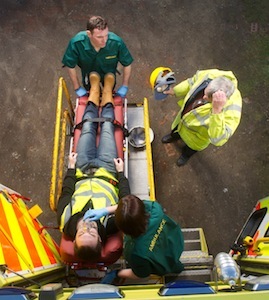 Workers who suffer catastrophic injuries may thus be entitled to lifetime benefits. In cases of death from a work-related injury, dependents may recover the decedent’s lost income and other damages associated with the loss. If you were injured on the job, call an experienced North Carolina workers’ compensation lawyer immediately. North Carolina law gives injured workers 30 days to provide written notice to their employers. Any delay in filing a claim may limit the value of your recovery or completely bar your right to relief. Anthony Privette has successfully handled numerous workers’ compensation claims, recovering millions of dollars for injured workers throughout North Carolina. He can help you present your claim in the most favorable light and aggressively pursue your case before the Industrial Commission. In fact, if you already filed a claim but still have not received any benefits, Mr. Privette can assist you in obtaining the maximum recovery possible through trial or settlement. Call Mr. Privette at (704) 872-8125 for a confidential consultation.